Sometimes I loathe the word “metabolism.” Sure, I’ve got one, and I am very thankful that it works. The problem is that sometimes it works a little too hard and the only thing I get done all day — besides working out — is eating. In fact, I’m on my third breakfast right now just to tide me over until noon. I’m almost afraid to mention my personal exercise and eating habits, since there is no shortage of divergent opinions about the best approach. There’s the body-building world that, at the competitive level, entails working out, eating and repeating all day long. The closest I get to this is pinching protein-rich recipes and a few workouts from Oxygen magazine. 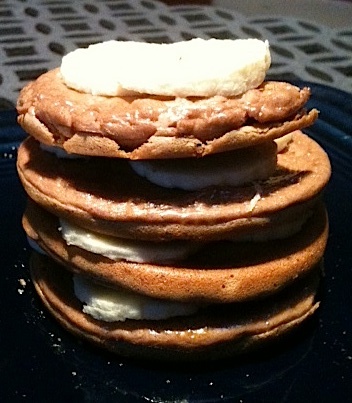 (I curtailed the recipe borrowing on that front after a failed attempt at chocolate protein pancakes, pictured below, which tasted like chocolate chalk held together by egg whites). They may look like normal pancakes, but don’t be deceived. Chocolate protein powder is not a good substitute for pancake mix. On the other end of the spectrum is severe calorie restriction, and I’ll stop short of eating disorders, which are not advocated by any health groups (except for that odd fringe group that used to post things on Pinterest). “2 Meal” Mike O’Donnell, for example, advocates on his blog theiflife.com for an intermittent fasting/feeding, or “if,” approach to eating, which he says provides freedom from excessive eating and exercising by eating just two, maybe three, times a day. As a former cardio-only carb-lover turned high-intensity interval trainer, I fall somewhere in between these two extremes. (A good manifesto on the case against excessive cardio can be found here… though I don’t agree with everything on Mark’s blog, i.e. I wear shoes when I run.) And here is a quick rundown by Livestrong.com on why women should lift weights. I want to be fit and healthy and, while I’m at it, to look like it, too. I don’t want to look like a body builder or even a female Crossfit competitor — and I certainly don’t want to have to eat like one. However, I cannot imagine myself surviving off of just two meals a day, especially if neither of those meals occurs during the breakfast hour (like I said, I average three breakfast-like eats before noon, partly because the breakfast realm contains my most favorite foods). But I’m always checking and balancing myself to make sure I’m still falling into that comfortable middle zone — a lifestyle zone that is livable long-term and not just to achieve short-term goals. For example, when I first started lifting, I slashed carbs and upped my egg intake to five or six a day. My muscles ballooned to a little bigger than I’d like and I found myself craving carbs. Now, I’ve moderated to no more than three eggs and usually eat them with toast (Ezekiel bread toast, to be specific). This is very doable for me. Even when I’m in my good zone, I must admit, I do require more daily food intake than the average female (while it still pales in comparison to my husband’s caloric intake). The only thing that appealed to me about the “if” plan was the idea of saving money on food. But then Mike got to the supposed “perk” of not having to obsess about food on this eating plan. What? Why would I not want to obsess about food? I love food! So maybe I’m realizing that I don’t particularly mind spending much of my day scrambling eggs and mixing yogurt and searing pork chops. I love to concoct, and snack time is one of my favorite and most difficult missions (how to make something semi-filling in a matter of seconds, before your rumbling stomach consumes one of your major organs). Real Simple’s latest mag included some good snack suggestions for such occasions… which takes away your last excuse to purchase those 100-calorie bags of air puffed rice! 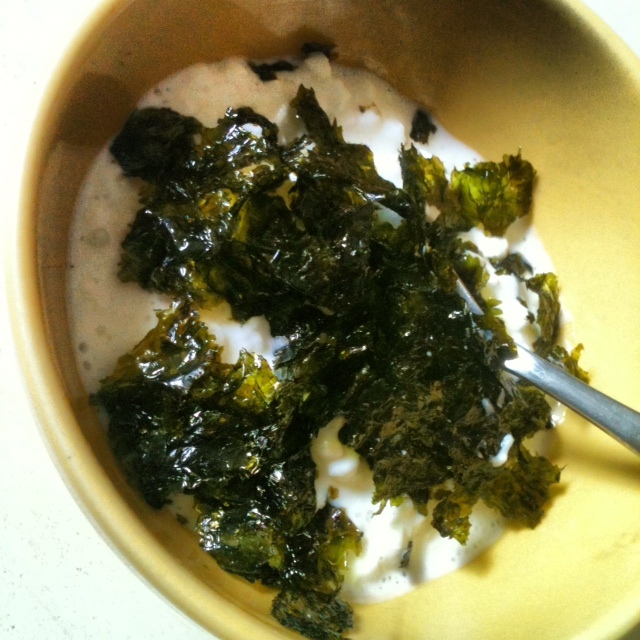 One of my favorite afternoon snacks of late: cottage cheese with Trader Joe’s baked seaweed strips crumbled on top. Maybe I’ll learn to embrace this metabolism of mine. I should be thankful for it, right? Though it can be pricey to feed the humans that live in our house, not to mention the dog, turns out it’s one of my favorite — and most frequent — pastimes.